Methods used work to get the horses trust before riding. They focus on getting the horse soft, willing, and respectful in a relationship with the rider with solid ground work first. Gaining control of the feet by moving them in all directions with the groundwork then on to the riding exercises. I want the horse trusting and respecting me before I ride them so it does not turn into a bronc ride. I want to be safe and make sure the horse has a good learning experience. Slow is better and the program sinks into the horse so they understand what is being asked of them. Your horse will be treated with care and respect. I want to know what your personal needs and wants are for your horse and strive to fill those needs. 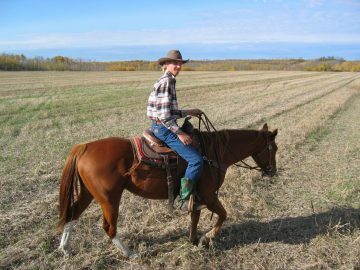 Many miles ,in all types of terrain, are put on the horses causing them to relax, soften up on the bit and think about what they are doing, creating a safe and dependable horse to ride.